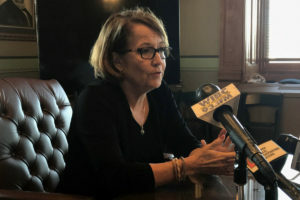 Indiana Supreme Court Chief Justice Loretta Rush says she’s encouraged by progress shown in a new type of specialty court. There are several types of so-called “problem-solving” courts. They include drug courts to help with the state’s addiction epidemic and others aimed at military veterans. Rush says one of the newest types is family recovery courts. “With regard to looking at children in the child welfare system and having a model with regard to safely keeping the kids with their families as they go through recovery,” Rush says. One of the state’s child welfare goals has long been keeping kids with their families whenever possible. Rush says family recovery courts provide greater oversight and collaboration to attain that goal. Indiana has seven family recovery courts (Bartholomew, Clark, Grant, Marion, Noble, Vanderburgh, and Wabash Counties), with four more (Allen, Delaware, Howard, and Vigo Counties) in the planning stages.